The basic problem in most rural and peri-urban areas in Uganda can lack of access to safe water and sanitation. Women and girls are disproportionately affected by the lack of water and sanitation as they are burdened with the task of fetching water and conducting a majority of the water-related chores. 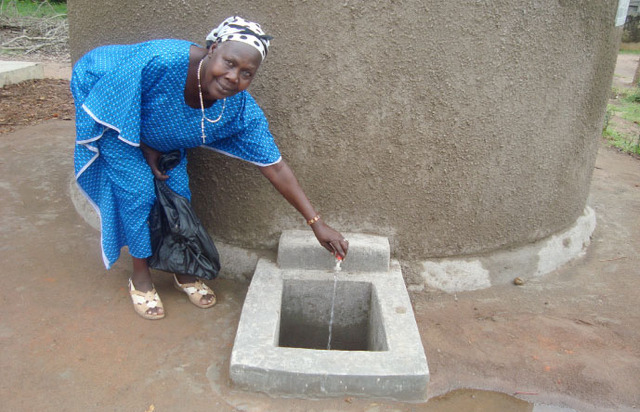 In Africa, many homes house elderly members of communities (mostly women) responsible for the caretaking of orphans although have access to water, it is not safe. Because of the AIDS crisis, a generation of working class has been decreased and many older people, widows and orphaned youth ultimately become the primary caregivers and responsible for the surviving children. In our experience, provision of training and financial assistance to women-led organizations to be able to provide clean water, sanitation and hygiene solutions and technologies has proven to be a viable way to contribute to improved welfare of families in the Ugandan context. This program will be building 2 different types of technology: The BioSand Filter and the ISSB Tank with rainwater roof catchments. The BioSand Filter is a household point-of-use water treatment that provides up to 150liters of clean water per day, removing 90-100% of biological contaminants. Everyday an average family (of up to 5 households) will have enough clean water for drinking, cooking and cleaning, reducing the risk of water related diseases. In schools, it provides enough drinking and hand-washing water for up to 100 children per filter. It is simple and easy to maintain, even for the children! It is also an entry point into the community to introduce good hygiene and sanitation practices as well as water resource protection and management. The BSF can be made locally by trained citizens, in our case - women, using local resources. The second technology is rainwater roof catchments with Interlocking Stabilized Soil Block (ISSB) Storage Tanks. The system including the ISSB tank is made out of all local materials and has proven to be a stronger and more stable alternative to polytanks and ferrocement tanks. The bricks are compressed in a special machine using manual labor (no electricity) available to purchase in East Africa. Unlike other bricks, it doesn't require drying in the sun and are ready to use in 24 hours. Because the blocks are interlocking, it creates a strong link between bricks and a stable foundation requiring less mortar for bonding. deepening their understanding about the interdependence of WASH (water, sanitation and hygiene) and helping them to create a vision of improved health and opportunity in their communities by offering sustainable WASH solutions. Both the BSF and the ISSB rainwater harvesting system have the potential to generate income for the women. The BSF can be built and sold to households, schools, community centers and other NGOs. Also, the women can be contracted to build ISSB tank and RWHs for households, schools, community centers and other NGOs. Both teams already have a history of supplying these technologies - MCS has been offered construction contracts for an international NGO in their community and KWDT has a BSF production facility to build and sell BSFs. 7) mobilize and/or engage with the local health officials for coordinated outreach. The BSF and ISSB program began a year ago when the women attended the GWWI Women and Water Training Program conducted in Uganda. MCS and KWDT conducted an ISSB and BSF pilot project having the technologies in schools and community centers. In assessing their user satisfaction and challenges they've begun to develop their business and marketing plan which includes construction, educational outreach, follow-up/monitoring and evaluation and water testing, they have identified some of the most needy householders and schools and are ready to implement the next round of BSFs and ISSB tanks and RWHs in their communities. MCS will be installing ISSB tanks and RWHs to local schools. Last year, when the women of MCS brought back the ISSB technology, it became a huge hit in their community, so much so that they were able to get local people to contribute to the purchase of an ISSB brick-making machine. They have already begun to sell bricks for additional income and have received a contract from an international NGO to build more tanks. KWDT will have enough funding to build 50 filters. 10 will go to schools, and 40 will be implemented in impoverished (shared) households, like grandmothers taking care of orphans. The requested program funding would subsidize the filters so the women can make the BSFs available to the most needy. The recipients would offer - supervised sweat labor for some of the more insignificant tasks - sliding scale to pay for what they can afford for the filter - at least 2 family members to attend at least 2 WASH Education seminars. GWWI has vetted and trained both the organizations included in this grant. KWDT has had success implementing projects in their communities ranging from Rainwater harvesting, toilets (Ecosan and VIP), ferro cement tanks, tippy taps for schools etc. MCS has helped mobilize women groups offering workshops on gender-based violence, involvement of men in reproductive health and safe water and sanitation challenges. As a winner of the home and environment competition for three consecutive years, MCS has been training women and men in income generating activities such as poultry farming, tree nursery management for floriculture and orchid establishment and vegetable gardening. 3) the organizations add comprehensive WASH services and new technologies to their stable of services for their constituents. Job skills - the women in both organizations will add additional WASH technologies and strategies to their stable of existing services. Our ultimate goal is to have these 2 organizations become centers of comprehensive WASH Services and Expertise. GWWI is applying for this grant from PWX to provide the women with the funds to continue to replicate technologies, promote their services, qualify for larger international grants and local government contracts by professionalizing their services. BSFs require no maintenance, however each BSF installation will require at least 4 visits/year (included in budget) to ensure that the filter is accepted and working well and to conduct water tests. as for the RWHs and tanks, the women will train householders or maintenance committees to be able to maintain the tanks. They will visit the tanks at least 2 times in the first year and be on call for any repairs. Implementing org #2 - MCS is Marindi Co-operative Society is an organised group composed of women and some Youths and men. The group’s main activity is carrying out small scale credit and savings services to its members. MCS members Angella and Martha are GWWI trainees and will be implementing the RWH projects. They are both retired nurses and health workers and continue to offer health education, gardening, poultry farming, tree nursery management and other vocational training. Just thinking, on PWX do you want GWWI to hold the implementation or should we introduce your two sister organizations and let them report on the progress and evolution of the project? GWWI could be always put in peer reports to clarify progress. And there is one new feature - privacy - about to be released (next week) so that communication between GWWI and implementer can be kept internal to your orgs. These look like 2 completely separate projects that should be 2 separate applications. What is the reason(s) you have put them together? I didn't think to separate them since we are managing them. I thought I could only submit one application. No other reason. How many women have been trained at the GWWI Women and Water Training Program? How many training programs have there been? When was the first training? How many women are currently in the field creating and marketing the two products? How many trainers have the trainers trained? How many products have been sold or donated to date? There have been 90 (45 2-person teams) grassroots women trained in our Grassroots training and 16 women in our ToT program. There have been three cycles. Each cycle has one formal training where all the women come together in the aforementioned cities and learn side by side. Then each team of women will receive an onsite training with expert trainers (GWWI partners) to refresh their knowledge and train more of their organizational team members. first formal training was in Nairobi, Kenya at Wangari Maathai's Green Belt Movement Training site - Wangari was an honored guest offering the closing speech. There are actively 2/3 of the women who have implemented. The other 1/3 have either delayed or may not be able to continue due to one thing or another. We had 2 deaths during this time and some women who have left their organizations. All the women consider themselves WASH Education trainers. Every single one. About 1/2 - 3/4 have the capacity to train in the technology. I'm not sure how to answer this because these are not all "products". I'm currently in the field right now gathering impact data, so I can have a better and more specific answer for you in October. But in terms of impact, I can give you a general - approx over 20,000 people have access to clean water and/or sanitation thanks to the women trained to date. We also work in Uganda (Luweero and Masindi currently), but we focus on sustainable water access projects. I appreciate the approach of your work. Some tribes in Uganda are especially hard on women, burdening them with ALL "household" things, like hauling water; empowerment is a great thing. How long do the filters last that they are trained to build? What is the sliding scale used for sales of the filters and tanks? Who and how are profits kept? Is it up to the trained/graduated women to make up a price and keep profits? Do they owe anything to your org? If the trained women control the profits and their own "businesses" after training-how does your org ensure the people metrics mentioned (12,000) are met? Who controls the "subsidy" help for the end consumer? Do the trained women get physical tools located in the budget or is that a one time purchase for the training center? If the women do not get the tools, how do they move forward with their own programming/business planning? Do most women start businesses in conjunction with the woman's organizations they are involved with when you meet them or do they break away into their own enterprise? If so, this relates back to my metrics (people served) question. What do the portable labs test for? Where do they "reside" when not in use, and how long do they last? Budget-what is included in training costs? What is your role in the training/org/etc? Thanks for bearing with all the questions. Keep up the amazing work and congratulations on your organization's awards! The oldest filters we know of are over 20 years old. These filters are being used all over the globe in dozens of countries. the oldest filters that I personally have built are 6 years old and are still in use. For the tanks and filters that we are implementing for this particular grant we don't have a sliding scale perse. The costs for the technologies that are being built in impoverished households (grandmothers caretaking orphaned youth) are covered by the grant. The school and organization's responsibility is to mobilize community members to offer sweat labor as their 'contribution'. Also, those using the technologies would be required to attend WASH education trainings - students, teachers and/or families. As for the business of selling the filters and tank construction services to other individuals and households both Teams have micro-financing options for individuals and households. As for entities/organizations they would pay full price for the construction and installation of the technologies which also includes costs for follow-up, WASH Education and monitoring and evaluation. For example, Marindi has received a contract from an international NGO who has an office in their region and the NGO has paid full price for their technology implementation which includes that above items. Who and how are profits kept? Is it up to the trained/graduated women to make up a price and keep profits? The Teams (graduates) keep the profits. Do they owe anything to your org? GWWI doesn't receive any royalties for the technologies that the Teams build. But the Teams do invest in their training participation by raising funds to register. GWWI helps the Teams find financial supporters so they can pay for their participation. We have GWWI local field worker contracted in Uganda who is the Team's on the ground coach and mentor and are available for technical, organizational and planning support. The field worker also conducts field visits as part of our training program. The women have already bought their tools and equipment from a seed grant they received from GWWI funders. The seed grant covered the costs of all the tools and equipment (with the exception of the ISSB machine - Marindi raised the money from their community to buy the machine). All they need are materials to build. The micro-enterprises we are referring to are not the recipients of the technologies, but the women's Teams and their respective organizations. The organization providing the services are financially benefitting from the technologies and these organizations are led by women. What do the portable labs test for? Test for e.coli to identify contaminated water and promote hygiene education, source protection and water treatment. Where do they "reside" when not in use, and how long do they last? They have about a year shelf-life if stored correctly (in dry cool place) like an office. If you are referring to the training costs in the co-funding section, the training costs have already been covered in Phase 1. We are in Phase 2 now. But to answer your question, the training costs are GWWIs estimated costs for our training services. The graduates of our 2011 training either paid for this themselves or GWWI helped raise sponsorship to cover this for teams who did not have access to funding support. We are a training and coaching organization. The majority of the women who have attended our trainings had never picked up a shovel before in their lives. We have created a peer support infrastructure that keeps in constant touch with the Teams to help them think through challenges, planning, efficiency and design. Our goal is to support the Teams to be able to design, implement and manage their own water and sanitation programs. This includes being able to raise their own funding, integrate follow-up,M&E and WASH education into all their programs and start taking the lead in their local water solutions. Thanks so much! It was quite a shock when I found out yesterday that I was named one of the Top 10 Water Solutions Trailblazers by Reuters. Very humbling! keep up your great work as well! We're all in this together all over the planet! Gemma- thank you for your thorough responses. Have a great day! Can you give a little perspective on the beneficiary counts you have put? A timeline perhaps. I would like to know your target in the first and second year. Your model of training entrepreneurs may not always live up to the plan (of course we hope it does exceed!). So please provide some of your thinking in terms of how many will be trained over time and what you expect each team to do over time and how many you expect to succeed would be good. The beneficiary counts are based on the size of the schools/community centers that they will be implementing the technologies. Each one of the Teams that graduates from our GWWI training consist of 2 women. In this case, we've already trained these women, they are now implementing. The model is to get the GWWI graduates that we have trained in our formal trainings to a point where they are generating income for their organization. The village women that the GWWI graduates train are their team members within their organization or are their target community - who work together with them to construct - we don't expect 2 women (our GWWI Graduates) to build the tanks themselves- on average of all our teams train about 20 people to build technologies. There are different ways the GWWI graduates and their beneficiaries have been earning money. The success of our program is based on our women's teams and respective organizations to be able to generate their own income through products and services, acquire their own contracts, access their own grants. Some of our GWWI graduates have been receiving training fees from local and international NGOs as well as local governments. Others have sold products like the Biosand Filter or solar and fireless cookers. Others have conducted water tests for local orgs/governments. A few of our teams have been offered governmnent and NGO contracts to build more technologies. They will receive payment for their construction services.We provide them with tools to be able to offer products and services that can generate income. Currently there are 3 new organizations that have been formed specifically to function as local GWWI Training and Implementing organizations. We are just conducting our year-end impact survey now and are finding that there have been over 100 women and men who have been trained by the GWWI graduates themselves. Do you see the work reaching 100% of the community? What barriers (socio-economic) exist that make it hard to do that? Could you give some timeline of what you believe will be accomplished in a year? I see your training spreading nicely. But do all the trainees build? Aren't there 'dropouts'? Have you noticed whether they at least build and maintain a filter system for their own use or some not even that? Can we devise a system to measure and track this? So, as far as reaching 100% of the community, that will be up to the women whom we trained. Ideally, our goal is to support them to do just that. But ur first priority is to get women involved and implementing solutions. They are the most burdened, they are the ones who will have the most investment. The next phase of our program is going to train them in all things WASH related - they'll be able to build point of use technologies for water access (RWH and tanks), water quality (biosand filters and other alternatives) and sanitation (toilets). The phase we are in right now is to get them to a point where they are well versed in all things WASH, can provide a variety of WASH services and earn income from the various services and products they have. Because these women have target areas, they have goals to have 100% reach of their target communities. If they spread beyond their communities, it will be a bonus. As far as the timeline, within the year, with this grant, most of the schools in their and some clinics in their target areas will have access to water (RWH/Marindi) and safe water (BSF/KWDT). As far as your second I don't consider the women who have not implemented "dropouts". They have not had the capacity to implement yet - at least the larger technologies. However, at the very least, they all have spread WASH education in their communities to improve hygiene and awareness of contaminated water and what to do. that said, I think you are referring specifically to the filters. We have not heard of any of the women only having BSFs for themselves. When we offer seed grants, we require that the funds for the technology implementation go towards needy and vulnerable people in the community. If the women have their own filters, they have either bought it themselves, or their board has agreed to have them own one so they can be evangelists for the filter. As far as we know, none of the women who have built BSFs and have owned them have not abandoned them. We are currently doing an intensive follow-up and M&E tour to all our 2011 training sites. We have incredible reports from the field and verifiable impact after interviewing users, non-users and implementers with the intention of finding gaps so we can provide support to fill those gaps. The project sounds like a win especially if the recipients can take the knowledge given them and make a difference in their communities. You mentioned the Biosand Filters in the homes and schools will produce 150 liters of drinking water per day. How large are the filter bodies for these BSF's and are they using plastic or a cement mold? Thanks for your question. We actually build the concrete filters using a steel mold. It's a concrete rectangular structure 3'h x 1' square. 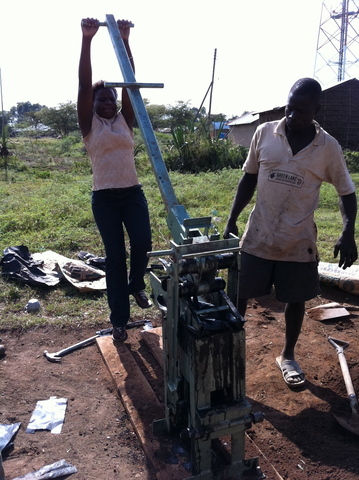 All the materials and equipment are accessed and can be built by local women. Thank you for the response Gemma. It appears you are building the cement filters designed by CAWST or similar to. My understanding is that these filters can only produce 60-80 liters of clean water per day, where yours are producing 150. Are you adding additional treatment to the water, or are you doing something different to produce these higher results. Sorry, that was a typo. Thanks for catching it!. We promote the 100liters (not 160) per day. I learned the tech from CAWST in 2005. We have not transitioned into the post 2008 filter. Thank you for the response Gemma. Yes, from our experience with CAWST filters, 150 liters a day is quite high. I am not familiar with the earlier versions of the filter so cannot comment on their capabilities, but hope that the ladies installing the filters are thoroughly training the end users so as to provide them with accurate information and the best quality of water for their families. It's great to see your organization assisting and promoting women throughout the world and I like the project. Keep up the good work. In the "Metrics to be Measured" section, you have put a long list of impacts you hope to achieve. So we want to know what you will track that you would like to graph over time. Could you be a bit more specific at least 3 metrics that will help you see if your plans are being met over time? So it could be any or all of the ones you mention, with a measurement frequency and a scale (could be yes/no or percentage or number). Am still trying to get a few metrics with a frequency. Ones that you would measure repeatedly over time. The ones you have listed above are all one time and as you very well know, that its long-term assessment and trend-spotting which is needed to take the water sector to the next level of actual impact. In our earlier participation in these projects, we have not seen any of this data - when did you start this measurements and do you have any results so far? Again, one of our main goals is to have women participate and contribute in WASH strategies and solutions in their communities. We are and will be tracking with more rigor, their capacity to implement on their own, generate income, receive direct funding and support - that to me - is one form of sustainability we are committed to. Part of our training is to ensure that there is a mechanism for constant evaluation and M&E as the women implement their projects. The trend spotting that we feel our work can contribute to the WASH sector that there is very little data on, is women's entrepreneurship and contribution to the WASH sector. How has women's participation been able to provide where there has not been provision? These are the gaps we want to fill and at the same time getting women involved and engaged and contributing towards an issue that affects them directly. Using ISSB for tank construction is a great idea. How are the interior surfaces of the tanks treated to maintain water tight seals at the base and any through-wall penetrations like piping for water taps? I note in the photo in the application that there is some leakage where the tank wall meets the base and I would expect the such leakage paths would become worse with time. Thanks for your questions. We like the ISSB tank alot. The interior lining of the tank is sealed with water proof cement. In general, when using ISSBs for construction in structures that are not holding water, it doesn't require mortar between every brick like normal rectangle bricks. Obviously, when building the tanks, it requires mortar between every block. I'm going to ask the implementer about this particular picture. I believe it was taken right after the tank was built and there's a bit of water in it to cure the cement. I will ask if that leak has been sealed through curing. I haven't heard any news from the team that it is leaking. But i will double check. Thanks. If ISSB's are as good as they sound, they can significantly reduce the cost of RWH systems, so I am eager to learn about how they hold up over time. Has GWWI used ISSB tanks in other projects that have been in operation for awhile? We learned how to build them from an organization in Uganda called Connect Africa. They train and have implemented them all over Kenya and Uganda for a number of years. They have also been using the bricks in the repair of ferrocement and polytanks. GWWI just tried to start building them last year and when there was a leak problem, Connect Africa came back to help us with the repair so we could have a maintenance and repair training. They are on call anytime for support. When built correctly and with community training in repair and maintenance, as in many appropriate technologies, they have the capacity to last. What's great about the technology, the machine is manufactured in Kenya and can be transported to Kenya and Uganda with ease. Also, with the machine that makes rounded bricks, they can be used for traditional round houses requiring less mortar. Some of our teams are trying to save up money to buy a machine that makes rectangular bricks so they can use it solely as an income-generating activity by selling the bricks. The bricks don't need to be dried in the sun like traditional earthen blocks and are ready to be sold within 24 hours regardless of weather. We are working in West Africa, specifically Sierra Leone at present. Do you know if Connect Africa has ISSB presses available in other African countries? It sounds to me like this system should be available in other regions. Are the presses and molds available for sale? Than you for the information. We'd really like to try ISSB tank construction on an up-coming project. Great Mike. Why don't you email me and I'll introduce you to Connect Africa. I'm sure he would have more insight on where else they are available. I can also do some research as well. Happy to. I just checked the Connect Africa website and now I'm really intrigued. I greatly appreciate your information and will email for an introduction to them. This project sounds very ambitious. If all of the objectives can be accomplished it would certainly be a worthy project. The community contribution is impressive. The monitoring plan is also very ambitious and I would love to see specific indicators that measure "women's inclusion in community WASH decision making," at the community level. Having worked with GWWI over the years and having funded some of their women's initiatives, we do see and empathize with the difficulty of getting these women to provide data and participate on the PWX platform. While we feel that these are worthy initiatives, we feel that there has to be some way to include them in the process. What we were disappointed in was that GWWI itself with a internet-savvy American representative in the field did not do their part on reporting on the data. Do not see how that has changed (the local staff), but we really need a strong commitment from GWWI that someone other than Gemma will ensure progress reports and data will be entered so we can clearly see results and impact on the field. Not the flashy reports used in the WEA fundraisers but information that shows what is happening on the ground, the challenges, and the adaptive response. Both ISSB tanks and Biosand filtes and appropriate technologies for east africa. It is also excellent to see a women's group heading this up and providing solutions for their families and their communities. I like the project a lot but am very concerned that the information shared on the proposal regarding biosand filters is not completely accurate, which makes me wonder what information is being shared with the community. As the biosand filter is quite temperamental, its end user must be fully aware of its capabilities, maintenance needs, etc. or it may not produce clean water. Educating the end user with accurate information is vital to the success of the biosand filter. I would recommend funding this project, but also recommend a follow up CAWST training for the womens group to ensure the correct information is getting to the end user. The bio-sand filter program is a good one, incorporating WASH education and teaching construction of filters from local resources with the added opportunity of local business start-ups. The relatively long useful life of the filters creates an on-going educational component, as each person coming in contact with a filter will learn a bit about sanitation and the significants of clean water. The project sounds solid, a wonderfully empowering opportunity for women. As I think I always feel during this peer review process, there are still some pieces that are missing for me, mainly outcomes. Perhaps this will be answered following Gemma's trip to East Africa. I also think we would all benefit from a face to face conversation/presentation and Q&A of our projects. SKYPE would be one way to do this. Would be great to get the Samburu women involved with the training at some point.